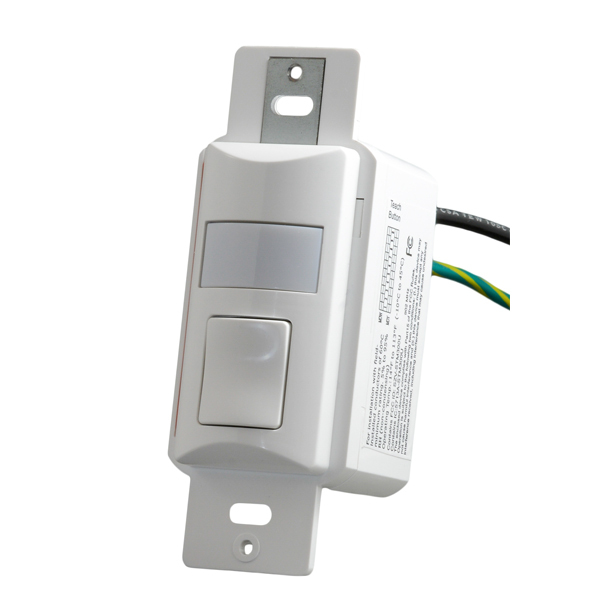 The OWS Wall Switch Sensors are line-powered, wall-mount, occupancy/vacancy sensors with an integrated rocker switch that communicates wirelessly to Echoflex controllers. The OWS is a no-neutral, conductor-powered device connecting to line voltage and earth ground ( <0.5mA). The OWS sensors are ideal for installation in small offices and boardrooms requiring on/off switching, dimming and occupancy/vacancy sensing. The Dual Tech version of the OWS sensors provides the most advanced technology of passive audio-sensing across the entire PIR detection range, ensuring lights stay ON when the space is occupied. Innovative noise filtering is used to prevent false occupancy triggers. The OWS is available in a wireless, battery-powered version, the OWS-BTY. The OWS-BTY complies with NEC 2017 directives to eliminate manufacturing of electrical control devices that introduce current on the grounding connection, or “no-neutral” devices (NEC sections 404.2 and 404.22). It includes the same features of the line voltage power version, including a dual tech option.